Precious metals were hit hard this week. In dollar terms, silver was down 5% and gold dropped below a price of 1.200 dollar per troy ounce. Today, the prices of gold and silver continued to decline. What is causing this decline? Last week, the Fed’s Open Market Committee (OMC) announced to fully phase out QE3. Precious metals dropped in price, while the dollar strongly appreciated. Therefore, gold and silver prices dropped more heavily in terms of dollars than in terms of euros. Is this the moment to panic or to buy (even more)? You may aware of my opinion; I would buy. More so, I am buying. But perhaps you have yet to hear the remarks related to this ‘’barbaric relic’’ (according to Keynes) from the man deemed by many to be the world’s most famous central banker. Alan Greenspan, former Fed chairman. Once covering Time Magazine’s front page as ‘’Mr. Dollar’’ and praised for his leadership (debatable). He is now retired and, perhaps, more honest than ever. Greenspan started his narrative with several statements that, coming from a central banker, are quite bold. For example, just hours after the end of QE3 was announced, he stated that the asset purchasing program has contributed little to the real economy. He didn’t stop there, but continued: ‘’I don’t think it is possible for the Fed to reverse its ‘’easy money’’ policy without causing problems.’’ In other words, just like us, Greenspan expects structural problems to surface now that Fed stopped its QE operation, or when it will raise interest rates. For this reason Greenspan believes the hands of the Fed are tied. As soon as it raises interest rates, financial markets may very well be stricken by a volatility upheaval. ‘’These days, gold is a great place to put your money,’’is Greenspan’s advice, ‘’given its value as a currency free from government policy.’’ Itcould easily have been one of our statements. Alan Greenspan is not the only central banker whobelieves in gold. Richard Fisher, chairman of the Regional Fed in Dallas and former board member of the Fed’s OMC, also invests in gold. He owns over $1 million in gold (the exact figure is unknown). Fishes also owns physical platinum. Fisher never explained his motives. We do not even know the magnitude of his total gold holdings relative to his total portfolio ($21 million). Five percent? Ten percent? Twenty percent? And does his gold investment merely serve to diversify his portfolio or does Fisher anticipate inflation? In recent years, the Fed has embarked upon an unprecedented monetary experiment. It has started to nationalize long-term interest rates. Traditionally, central banks have only targeted short-term interest rates. By buying short-term debt instruments, they allow the market to determine long-term interest rates to a large extent. Correspondingly, the ECB’s balance sheet declined significantly in size over the past years simply because the ECB held on to its short-term debt instruments until maturity and subsequently did not roll them over. The ECB’s balance sheet shrunk. However, the Fed is buying long-term debt instruments; an essential difference. This might come as a shock, but the Fed now owns over 50% of the U.S. bonds with maturities between 10 and 15 years. Contrary to the ECB, these bonds will remain on the Fed’s balance sheet for the coming 10 to years, given that the Fed does not sell them. De Fed is dus haar QE-opkoopprogramma absoluut niet aan het terugdraaien. De balans van de centrale bank zal niet zondermeer krimpen, zoals bij de ECBwel het geval was. So the Fed isdefinitelynot reverting its QE asset purchasing policy. 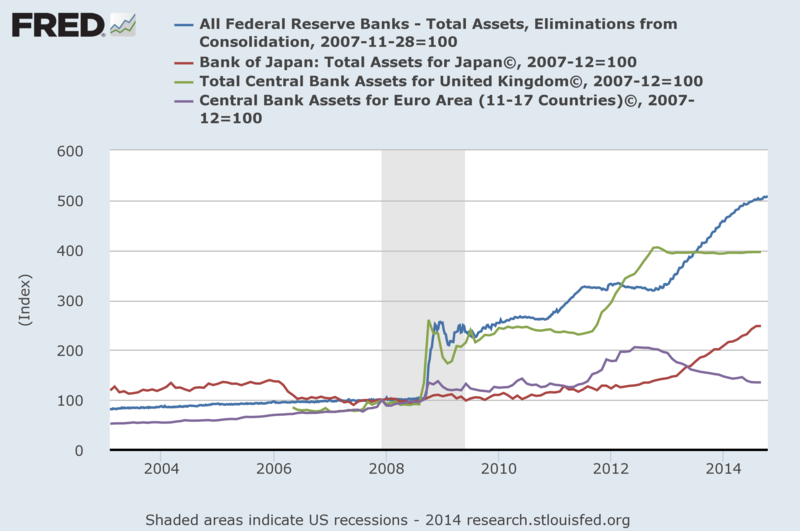 Its balance sheet will not automatically shrink, as actually did happen with the ECB balance sheet. The ECB’s balance sheet declined significantly in the years.The Fed’s balance sheet, however, has increased strongly and will not automatically shrink as was the case with the ECB. Reverting QE would imply that the Fed has to sell bonds. However, this would have disastrous consequences for the interest rates to be paid on the U.S. national debt. However,on the other handanother QE program would force the Fed to be an ever larger part of the outstanding U.S. government bonds. The Fed’s power is thus clearly limited. Two options remain: (1) the U.S. government has to run an even higher deficit, or (2) the Fed has to starting acquiring other assets than U.S. government bonds. Many market participants use the 10-year U.S. government bonds to hedge interest rates and as collateral for futures contracts. For example: a hedgefund wants to borrow $100 million on the spot in order to speculate. To obtain the loanthey pledge U.S. government bonds as collateral. Pension funds are also faced with requirements that force them to invest a certain percentage of their equity in government bonds. They are forced to invest in government bonds that become ever more risky. Moreover, many countries ‘’peg’’ their currency to the dollar. They are forced to buy U.S. government bonds to keep their exchange rates with the U.S. dollar within the targeted limits. These are some examples that illustrate why a high degree of liquidity of U.S. government bonds is of crucial importance the functioning of the financial system. Greenspan is therefore right. The Fed cannot revert its bad policy without suffering any consequences. As soon as it shrinks its balance sheet, interest rates will rise and once more the economy will fall back into a recession. For the time being, gold has had its low in terms of euros past Christmas. In terms of dollars, this happened this week. Friday afternoon, the gold price declined to $1,160 dollar per troy ounce. But as Greenspan admits, challenges still lie ahead of us. Whether it is the result of QE3’s phasing out or the raising of interest rates, the economy will once more fall back into recession and market volatility will go through the roof. Investors that know how to evaluate the words of this former central banker are therefore buying gold at this moment.